Try our free retirement assessment - it only takes minutes to complete! What does retirement mean for my monthly income? What do I want to do or accomplish after I retire? What investments (stocks, bonds, commodities, mutual funds, ETFs) should own? What do I do with my 401(k), 403(b), IRA, Profit Sharing plan? 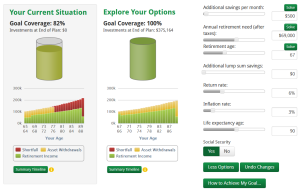 What pension options should I select? When should I start drawing Social Security? Do I need to work part-time? Should I pay off my house or does refinancing make sense? How much can I spend (use) each month for my living expenses? How many years of retirement should I budget for? Interestingly, the average two person retirement of a 60 year old couple is 25+ years. One person will likely not live that long, and one will on average live longer. You need to be prepared to fund that time frame and know your options if you aren't. What are your expectations for the rate of inflation? This factor can be a silent yet significant lifestyle killer. Historically, inflation has averaged approximately 4% over the last 4 decades. What inflation rate you experience over the potential 3 decades of retirement will significantly affect your purchasing power. Investments do have risks, but sometimes playing it too 'safe' can actually cause long-term problems. Knowing the appropriate mix is critical. Will Social Security payments increase? This one is difficult. Social Security increases are based on the CPI or Consumer Price Index. It is a basket of 2000+ items that the government uses to gauge inflation and adjust Social Security increases. Unfortunately the items that we tend to spend most of our income on - food, energy, clothing, etc.- make up just a few of the items. Inflation tends to hit these staples worse than the rest of the items in the CPI, hence payments go up less while costs of the real items we need go up more. How do tax code changes affect your planning? While we do not know what the future tax code will be, candid conversation about what changes will be made in your investment and distribution strategy are important to have before they become issues. It's important to know what your options are so that you can plan accordingly. Where do we go for help caring for an aging parent? What happens if a spouse dies prematurely or unexpectedly? What do we do if one of us needs to be in a care facility? Once we are able to discuss, analyze, input and develop all the data surrounding your situation, we deliver a concise report as to what your current situation (needs and goals) looks like over time, taking into account income streams, inflation and investment growth. We also have the ability to illustrate numerous retirement alternatives (ie, retiring earlier or later, using a different investment allocation and/or living on more or less income). Finally, we provide specific recommendations which we believe increases the probability of achieving your objectives. No matter what stage of retirement you are in, from 10 years away to several years into it, everyone can engage in financial planning and see results. We invite you to contact us and Begin the Conversation.